The nation’s conspiracy-theorist-in-chief is facing a momentous decision. 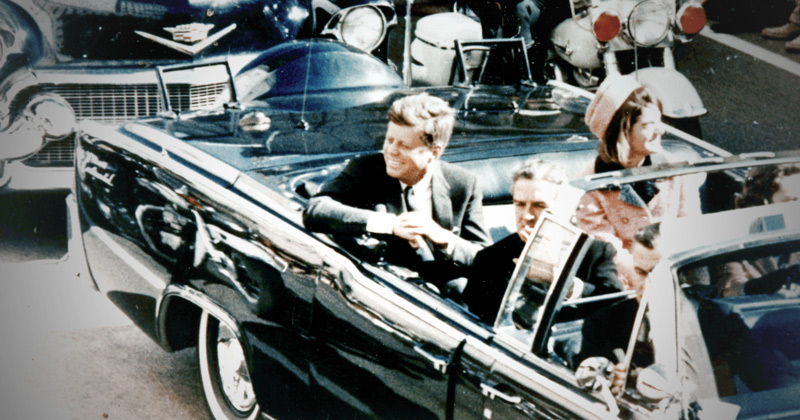 Will President Donald Trump allow the public to see a trove of thousands of long-secret government files about the event that, more than any other in modern American history, has fueled conspiracy theories – the 1963 assassination of President John F. Kennedy? The answer must come within months. And, according to a new timeline offered by the National Archives, it could come within weeks. Under the deadline set by a 1992 law, Trump has six months left to decide whether he will block the release of an estimated 3,600 files related to the assassination that are still under seal at the Archives. From what is known of the JFK documents, most come from the CIA and FBI, and a number may help resolve lingering questions about whether those agencies missed evidence of a conspiracy in Kennedy’s death. As with every earlier release of JFK assassination documents in the 53 years since shots rang out in Dealey Plaza in Dallas, it is virtually certain that some of the files will be seized on to support popular conspiracy theories about Kennedy’s murder; other documents are likely to undermine them. There is no little irony in the fact that decision will be left to Trump, long a promoter of so many baseless conspiracy theories about everything from his predecessor’s birthplace to the notion that the father of one of his campaign-trail rivals was in league with JFK assassin Lee Harvey Oswald. Under the 1992 JFK Assassination Records Collection Act, the library of documents about Kennedy’s death must be made public in full by the deadline of this October 26, the law’s 25th anniversary, unless Trump decides otherwise. It is his decision alone. The prospect of the release of the last of the government’s long-secret JFK assassination files has long tantalized historians and other scholars, to say nothing of the nation’s armies of conspiracy theorists, since no one can claim to know exactly what is in there. Martha W. Murphy, the Archives official who oversees the records, said in an interview last month that a team of researchers with high-level security clearances is at work to prepare the JFK files for release and hopes to begin unsealing them in batches much earlier than October – possibly as early as summer. Many of the documents are known to come from the files of CIA officials who monitored a mysterious trip that Oswald paid to Mexico City several weeks before the assassination – a trip that brought Kennedy’s future killer under intense surveillance by the spy agency as he paid visits to both the Soviet and Cuban embassies there. The CIA said it monitored all visitors to the embassies and opened surveillance of Oswald as soon as he was detected inside the Soviet compound for the first time. Other documents are known to identify, by name, American and foreign spies and law-enforcement sources who had previously been granted anonymity for information about Oswald and the assassination. At least 400 pages of the files involve E. Howard Hunt, the former CIA operative turned Watergate conspirator who claimed on his deathbed that he had advance knowledge of Kennedy’s murder. The documents were gathered together by a temporary federal agency, the Assassination Records Review Board, that was established under the 1992 law. In an interview last month, its former chairman, Judge John R. Tunheim of the Federal District Court in Minnesota, said he “wouldn’t be surprised if there’s something important” in the documents, especially given how much of the history of the Kennedy assassination has had to be rewritten in recent decades. He said he knew of “no bombshells” in the files when the board agreed to keep them secret two decades ago, but names, places and events described in the documents could have significance now, given what has been learned about the assassination since the board went out of business. “Today, with a broader understanding of history, certain things may be far more relevant,” he said. The Review Board, created by Congress to show transparency in response to the public furor created by Oliver Stone’s conspiracy-minded 1991 film “JFK,” did force the release of a massive library of other long-secret documents from the CIA, FBI, Secret Service and other federal agencies, as well as from congressional investigations of the assassination. Many showed how much evidence was withheld from the Warren Commission, the independent panel led by Chief Justice Earl Warren that investigated the assassination and concluded in 1964 that there was no evidence of a conspiracy in Kennedy’s death. The documents showed that both the CIA and FBI had much more extensive information about Oswald—and the danger he posed to JFK—before the assassination than the agencies admitted to Warren’s investigation. The evidence appeared to have been withheld from the commission out of fear that it would expose how the CIA and FBI had bungled the opportunity to stop Oswald. Both the CIA and FBI acknowledged in written statements last month that they are reviewing the documents scheduled for release; neither agency would say if it planned to appeal to the White House to block the unsealing of any of the records. “CIA continues to review the remaining CIA documents in the collection to determine the appropriate next steps with respect to any previously-unreleased CIA information,” said agency spokesperson Heather Fritz Horniak. The FBI said it had a team of 21 researchers assigned to the document review. According to a skeletal index of the documents prepared by the Archives, some of the files appear to involve, at least indirectly, a set of conspiracy theories that Trump himself promoted during the 2016 campaign – about possible ties between Cuban exile groups in the United States and Oswald. On the campaign trail, Trump repeatedly promoted an article published last April in the National Enquirer that suggested a connection between Oswald and the Cuban-born father of Senator Ted Cruz of Texas, one of Trump’s rivals for the Republican nomination. The article was based entirely on a 1963 photograph that showed Oswald, a self-proclaimed Marxist and champion of Fidel Castro’s Communist revolution in Cuba, handing out pro-Castro leaflets in New Orleans with a man who, the tabloid suggested, was Cruz’s father, Rafael. The Cruz family denied that the senator’s family was the man depicted in the photo and that Rafael Cruz had any connection to Oswald; there is no other evidence of any connection. The National Archives index shows that the documents to be released this year include a 86-page file on a prominent CIA-backed anti-Castro exile group that Oswald appears to have tried to infiltrate in New Orleans, his hometown, in order to gather information that might be of use to the Castro government. Judge Tunheim said that Oswald’s trip to Mexico City in September and October 1963 figures directly or indirectly in many of the documents that remain under seal, including the internal files of CIA operatives who worked at the American embassy there. Historians agree that the trip, which Oswald apparently undertook in hopes of obtaining a visa to defect to Castro’s Cuba, much as he had once tried to defect to the Soviet Union, has never been fully investigated. “I still think there are loose threads in Mexico City that no one has ever explored,” Tunheim said. “It was a bizarre chapter – there’s no question about it.” Previously declassified CIA and FBI documents suggest that Oswald openly boasted to Cuban officials there about his intention to kill Kennedy and that he had a brief affair with a Mexican woman who worked in Cuba’s consulate. The American ambassador to Mexico at the time of the assassination said later that he believed the woman had probably been working for the CIA. Tunheim said the Review Board agreed to keep the Mexico-related documents secret in the 1990s at the request of the State Department, the CIA and other agencies that warned that their release could do damage to relations with the Mexico government, which worked closely with the CIA and FBI during the Cold War. “Mexico City was where everybody spied on everybody else,” the judge said. CIA won’t finger themselves. They are knee deep in this. We will never known they and mob gunmen were responsible for JFK death. Glogalists hated Kennedy. He fired Allen Dulles and said he would smash them to pieces and throw them to the wind. Your remarks that “There is no little irony in the fact that decision will be left to Trump, long a promoter of so many baseless conspiracy theories about everything from his predecessor’s birthplace to the notion that the father of one of his campaign-trail rivals was in league with JFK assassin Lee Harvey Oswald.” sounds like a disparagement of those theories. They certainly were not “baseless”. One should not consider a theory to be conspiratorial because it is not popularly published by the media. Such theories usually evolve from lesser known facts that lead to questions of the truth. For example, the Obama birth certificate published on the White House website was proven, without question, to be a forgery. However, the liberal media refused to publish that fact for fear of the shadow it would suggest over Obama’s legitimacy. Ignoring the fact resulted in more questions and more theories. But, by no means were they “baseless” conspiracy theories. They were fact based theories. I’d like to say that failure of the government to be open and honest with our citizens could do damage to relations with our citizens. Obviously this has already occurred to some extent, proven by the wide mistrust felt by citizens towards the government. If the U.S. government continues to act against the citizens and in favor of the Mexican government, the mistrust will only grow. As will the theories….